Republicans Have God On Their Side: Poor old Civil Rights Lawyer! Poor old Civil Rights Lawyer! 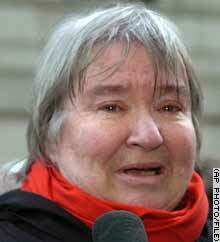 Lynne Stewart sentenced today for helping Omar Abdel Rahman. He was the terrorist that plotted to blow up five New York landmarks and assassinate Egypt's President. That is the kind of people that liberals are. They want to defend the very people that are determined to kill us. This is the kind of story that they do not want you to read about. CLICK HERE TO READ IT IN BLACK AND WHITE!